It’s not a new fact that the internet is fast becoming a global village, and a reliable avenue to make a steady income. This is due to it’s limitless reach and enormous opportunities, if managed appropriately. 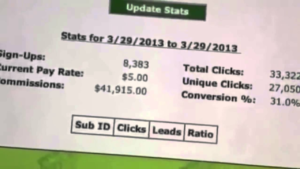 The “Make Money Online” sector is booming also because everyone wants a piece of the pie. But this is where people really get burnt. Their are countless illegal money-making schemes online. It’s becoming very difficult to click a button on someone’s website, without second-guessing your actions. There are scams everywhere, and they emerge in different forms. 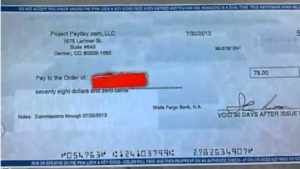 Here is a detailed review on a popular online company that goes by the name, “Project PayDay”. After reading this article, you’ll get to know the truth of the matter about what they do, and why they have become so infamous in the industry. 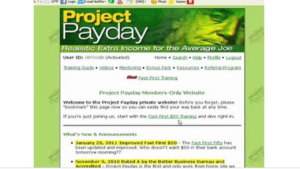 “Project PayDay” is an online company that has been in existence for years now (research shows it was founded, 2006), and it’s original founders aren’t known. The company has been linked to different people in the past as it’s founder, as well as many other websites (especially review sites), through which they use to portray an authentic image to the unsuspecting public. It was later discovered that a certain person that goes by the name Monika John, founded the company. But until this day, nobody knows for sure who the person is. The idea behind Project PayDay, was to create an online environment where people/companies can advertise their products or services, with the help of other people who are going to be paid commissions for doing so. These companies/people present advertisements, tasks, or surveys to be completed through Project PayDay’s online platform, while already subscribed partners (people who have paid to promote the Ads) do the job as described, before getting a penny. Literally..
Do people make money on Project PayDay? If so, how? People have reported that they’ve earned considerable amounts of money, ranging anywhere between $5 and $25. But it’s also said that this is only possible after spending a lot of time completing their surveys and sharing their links, via their private accounts. First off, the company promises to it’s customers and affiliates that they’ll have a steady flow of cash coming in, if they work the Project Payday system properly. Signing up for Project Paydays subscription is suppose to be free. But before you can collect on any commissions earned, you must first participate in one or more of their offers. And to make things worse, The majority of your commisions earned will be in the amount of pennies, not dollars. To be blunt you guy’s, I think it would be a waste of time engaging in this full-time. Not alone part-time. You’ll be working all day, just to make $1.50. 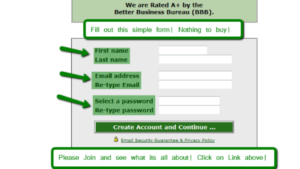 The compensation paid for surveys or promotions you’ve completed, is extremely low. It’s seems to me that the company is collecting loads of cash from their clients, and paying out the real money to the backbones of Project Payday. This option is quite simple. Project PayDay uses it’s platform to connect people to buyers that are ready to buy. They might also be asked by Project Payday to give up their personal information, like their name, their e-mail address, credit card information, and more. The agreed reward will then be paid afterwards. With this option, an individual becomes the buyer of the referrals, instead of being a referral. Here, the buyer will have to pay people to complete tasks and offers on multiple sites (which may not be theirs) and this method centers around cash out offers, and rewards. With this option, people are given the task to promote Project Patdays goods and services across different platforms, for an agreed commission. Depending on your payment agreement, you’ll be required to make a certain amount of sales before actually being able to cash out. 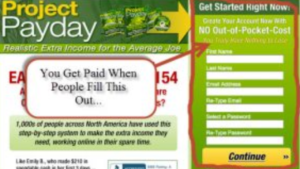 This method is actually one of the most profitable ways to make money, based on what “Project PayDay recommends” It supposed to be because of it’s high commission rates. Project PayDay’s idea was actually innovative because it brought two different groups of people together (the business owner and the promoter). The business owners and promoters help one another achieve their main goal. To promote their products/services, and make money. Judging from what I’ve seen on Project PayDay Ads and their Website, it promises their potential promoters and subscribers, the potential to earn a very handsome commission. The typical “work from home”, “work in your pyjamas” type of scheme. They made the process of making money look so simple and straight forward. 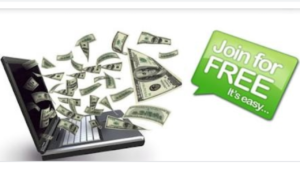 You would see something like : “Grab a link, promote it, and/or earn cash daily”. The truth is, it’s not that easy to make a dime. The common complaints people have, are centered around the very low and awkward commissions people receive. You’ll be completing long various tasks, and time-consuming offers. An analysis carried out on the website shows that it would take a lot of hours of reading, and clicking around the website, to make a dollar. An individual would be losing more than gaining if one chooses to promote links using their paid promotional services. Overall, the pay is too low for the cumbersome work done and many people look at this as exploitation. There have been multiple reports of Project Payday doing fraudulent business, as there have been cases of people accusing the company of illegally charging their credit cards without notice, while the company keeps changing their Terms and Conditions regularly, to blend with their illegal activities. The idea of signing up for an offer before promoting it, is not ideal. By signing up, an individual would have to pay a certain amount of money before gaining access to the deals. Most people complain about the conversion rates of the deals, and being unable to make sales large enough to cover the sign-up cost. Meaning at the end of the day, you’ve made ZERO PROFITS! Email spamming is a normal tradition in the online world. With that being said, the privacy of your personal details such as your identity, contact phone number, E-mail address, and your credit card details are all at risk. Reports of emails being sent to poeples email address from different sources is a huge trend here. People have complained about being registered illegally without their consent, into other random programs thru Project Payday, when all they were trying to do, is gain rewards. There have also been multiple complaints from people who have opted in to services they found and brought through Project Payday, but never received the product(s) they’ve bought. Like I said earlier, there are many forms of scams and not all scams take the form of, “not getting paid”. In Project PayDay’s case, people have claimed to earn money from their website, while some others have claimed to earn as much as $2000. This could mean that people actually do get their earnings, eventually. So with that being said, Project Payday is most definitely not a scam. we can logically conclude that Project PayDay is not a reliable and safe company to work with. Not now. Not ever. Even though it’s not a scam. Anyways, would you happen to have something to say about your experiences with making money working with Project Payday? Maybe something informative to add? If so, please leave a comment at the bottom of this post. I would love to know what’s on your mind, or simply how you feel about this company! Thanks for checking out my post, and good luck with all your success online! Are you tired of looking for legit work online? Check Out My # 1 Recommendation Now! !